High humidity, rising dew points, oppressive air. These are all phrases you'll hear in the days ahead because the combination of hot temperatures and high dew points will lead to higher "feels like" temperatures. Many will say "the relative humidity is so high" when you are at the office or getting groceries, but it's really the dew point that should be the conversation! The relative humidity often reaches 90-100 percent in the morning hours because the temperature meets the dew point or is close to it. But that doesn't tell you how dry or sticky the air is. But the dew point does. Check out this image below. Drier air is what we have when dew points are in the 50s. It starts to feel "sticky" with dew points in the 60s. 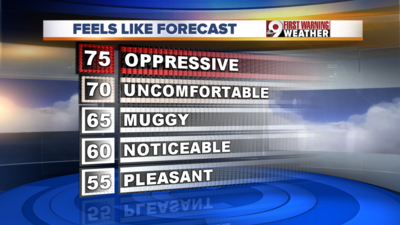 And dew points above 70° are flat out noticeable and uncomfortable. That's because there is a lot more moisture in the atmosphere. Check out the video at the top of the page for what the dew point rising from 60 to 75 does to a temperature of 95°F. Hint.. it's above 100°F!